Merry Christmas Happy Hanukkah - A Multilingual Songbook and CD, 2nd ed. This popular collection includes thirty-two Christmas (16) and Hanukkah (16) songs with complete verses in English, and many in Hebrew, Spanish, German, French and/or Latin. Each song is arranged in an elementary-level Five-Finger piano arrangement. Guitar chord symbols are included, as well as complete lyric sheets and a sing-along/play-along CD. 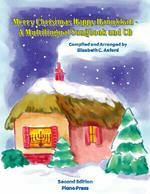 This collection also features four original Hanukkah songs, two by Elizabeth C. Axford, and two by Katherine Dines. Spiral Bound Songbook and CD, 60 pp.